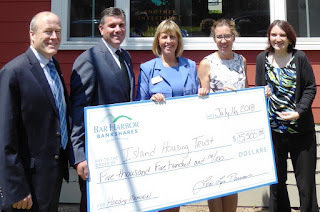 Greg Dalton, Curtis Simard, Lisa Parsons of Bar Harbor Bank & Trust present a check for $5,500 to Clara Baker and Alison Beane of Island Housing Trust representing the proceeds from the Bank’s 25th Annual David R. Harding Memorial Charity Golf Tournament played at Kebo Valley Golf Club on June 12. This year’s tournament benefitted the Island Housing Trust. Bar Harbor Bankshares (NYSE American: BHB) is the parent company of its wholly owned subsidiary, Bar Harbor Bank & Trust. Operating 49 branch locations across Maine, New Hampshire and Vermont, Bar Harbor Bank & Trust is headquartered in Bar Harbor, Maine and has more than $3.5 billion in assets. As a leading Northern New England community bank, Bar Harbor Bank & Trust offers a full range of personal and business banking services, as well as wealth management services through its subsidiaries Bar Harbor Trust Services and Charter Trust Company. For more information about Bar Harbor Bank & Trust, visit www.BarHarbor.bank or call 1-888-853-7100. Member FDIC.